Throughout the years, the Australian Grand Prix has provided Formula One fans with many great moments. When asked to choose one particular race to remember, from Down Under, most people would go for the 1986 Grand Prix, with the three way battle between Alain Prost and both Williams' of Nigel Mansell and Nelson Piquet. However, that's a story well known and sometimes, the stories which are long forgotten make for a better one. 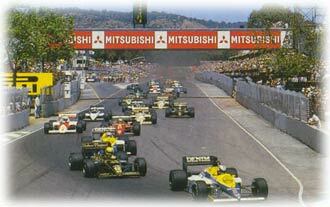 The 1985 Australian Grand Prix is that kind of race, with as much excitement as the 1986 one, and even more. This fact is particularly exceptional, since the title had been clinched already when the circus arrived in Adelaide. Alain Prost was largely without serious competition in 1985 and the Frenchman had the championship in the bag after the European Grand Prix at Brands Hatch, with two races still to go. Furthermore, before Adelaide was due, Ferrari driver Michele Alboreto was already sure of second place, despite not having scored a point for four straight races. The 1985 Australian Grand Prix was also Niki Lauda's last race, as well as Team Renault's - both historic names in Formula One. It was also Australia's first World Championship race. For all those reasons, and for a race which turned out to be truly remarkable, the Australian Grand Prix of 1985 goes in the books as a Race to Remember. First qualifying already showed some surprises and a close battle for first place. Both Alfa Romeos ended provisional fifth and sixth on the grid, a sight rarely seen during the season, Eddie Cheever being just in front of Riccardo Patrese. McLaren and Ferrari clearly had their minds somewhere else than Adelaide, with McLaren drivers Alain Prost and Niki Lauda provisional seventh and 13th and Ferrari's Michele Alboreto and Stefan Johansson surrounding Lauda at provisional 12 and 14. At the front it was both Williams' and one Lotus. Keke Rosberg took provisional pole in 1:22.402, with Lotus driver Ayrton Senna just one thousandth of a second behind him and Nigel Mansell less than two tenths behind. In the second qualifying session, the track was in better condition and that the drivers were quickly learning the layout. Times improved for all except the two Alfas, Pierluigi Martini (Minardi) and Piercarlo Ghinzani (Toleman). Both Tyrrell driver Ivan Capelli and Osella's Huub Rothengather weren't able to put in lap-times at all during the second session. The progress of the rest of the field was up to two seconds, putting the Alfas of Cheever and Patrese back to 13th and 14th on the grid. The young Austrian Gerhard Berger displayed a remarkable performance, qualifying seventh after ending the first session in 17th place in his Arrows. 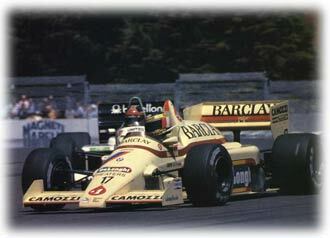 Also remarkable was Swiss Brabham driver Marc Surer, who outqualified teammate Nelson Piquet. Surer was sixth on the grid, while the Brazilian was 9th. In fourth and fifth were World Champion Alain Prost and runner-up Michele Alboreto. Just like Keke Rosberg was in front of Ayrton Senna by the smallest of margins, his gap over Alain Prost was almost just as small. The man from Finland put his car third on the grid, 0.002 seconds ahead of Prost's McLaren. This time a small gap wasn't by far enough for Pole Position for Rosberg. His teammate Nigel Mansell put down a stunning performance by qualifying a whole 1.3 seconds faster at 1:20.537. Mansell, himself probably convinced that must have been enough for pole, looked as though his eyes are about to pop out when Ayrton Senna came flying over the start-finish in his Lotus, taking as much as seven tenths off Mansell's time, and setting Pole Position in 1:19.843. On a hot Sunday afternoon, the cars lined up on the grid for the 50th Australian Grand Prix. A crowd of 107,500 saw Ayrton Senna having a good start, but being outpaced into the first corner by Nigel Mansell. The Briton's stay in the lead was a very short one though. In the sharp lefthander after Flinders Street, he was punted off by Ayrton Senna when the Brazilian dived into an invisible gap. Mansell slid into the dust and emerged from it in seventh. Senna however didn't succeed in grabbing the lead. While his black Lotus collided with Mansell's Williams, the second Williams of Keke Rosberg sneaked past into the lead. Meanwhile on the grid a small drama developed. Local hero Alan Jones' Lola stayed on the grid motionless. After a push by the marshalls, the Australian was on his way, but with a severe gap to close up to his nearest rival. Nigel Mansell had to come into the pits after his shunt with Senna, retiring with transmission damage. Another driver in trouble was Tyrrell driver Martin Brundle, who was moving very slowly, quickly being lapped by the race leaders Rosberg and Senna. Next man in trouble was Minardi's solo driver Pierluigi Martini, who spun off into the gravel. Just like Jones he was able to continue after receiving a push from the marshalls. This was just the first sign of the extreme tyre- and brake-wear. Frenchman Jacques Lafitte went into the pits after just seven laps, complaining of braking problems. Meanwhile, Rosberg and Senna moved away from the field with Michele Alboreto, Gerhard Berger, Alain Prost, Marc Surer and Elio de Angelis about ten seconds behind them. First one to drop from this train of drivers was Austrian Gerhard Berger in the Arrows, who appeared to have charged too hard too soon. After him Alboreto's Ferrari dropped back when Alain Prost slipstreamed past him on the start-finish straight, quickly followed by Marc Surer in the Brabham. While more and more cars stopped for fresh rubber, Alan Jones displayed a magnificent comeback, driving back to ninth place. Ayrton Senna didn't stop quite as soon as many others, but he backed off from Rosberg, leaving a gap of about five seconds. 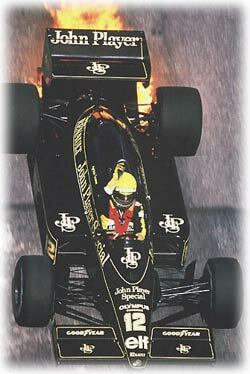 Of course it was almost mandatory for Senna to take things easier, because of the carbon fibre brakes used by his Lotus. These brakes were lighter and gave the driver better control, but the downside was the extra wear they had to endure. In his last race, Niki Lauda made a calculating progress from 16th on the grid to sixth place in the race. By this time, drivers dropped out of the race like flies. First out was Nelson Piquet in his Brabham after 14 laps with electrics trouble. 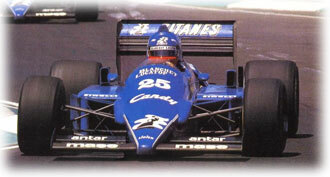 Next came a retirement without any car trouble, as Elio de Angelis was called in after 19 laps. The Italian was black flagged for having started from the wrong grid position, causing him to be disqualified. At almost the same time, Alan Jones had to give up after all, just like Renault driver Patrick Tambay. At the front Surer and Prost traded places back and forth, as Rosberg charged away from Ayrton Senna. After 26 laps the Swiss Brabham driver emerged victor over the new World Champion, when Prost blew his engine. 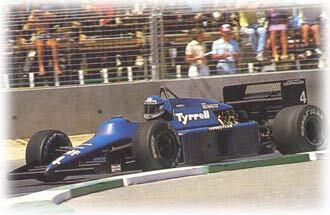 This was Prost's only mechanical failure all season. After this the leader-board showed Rosberg, Senna, Surer, Lauda, Alboreto in front. At this time Ayrton Senna pulled out all he had, closing the nine-seconds gap to Rosberg in just a few laps on worn tyres. This almost cost Senna his race when the Brazilian launched himself over the high kerb on the outside of the track while coming onto the Brabham Straight. Miraculously Senna recovered, but his braking problems were obvious by that time. After 38 laps, the two race-leaders were behind Michele Alboreto's Ferrari as they came onto the main straight. Much to the anger of Senna, the Italian let Rosberg slip by easily, while closing the door on Senna on more than one occasion. Behind the two leaders, only Surer and Lauda remained unlapped, although over 40 seconds behind. After Senna finally passed Alboreto, having been stuck behind the Ferrari driver for half a lap, the Brazilian quickly closed the gap to Rosberg to almost nothing. In fact, when Rosberg slowed down for entering the pits, the black Lotus moved into the rear of the Williams, ripping off the right front wing. Senna's Lotus then grabbed the lead, but the lack of downforce from the front-wing, in combination with the heavy tyre-wear, seemed to make the car nearly undrivable, as Senna moved right over the same kerbs at the start of the Brabham Straight that had almost cost him his race earlier. As the Lotus crew were standing ready to receive their driver in the pits, Ayrton Senna completely lost the car while braking just before the pit entrance, causing the Lotus to slide into the gravel, losing the other side of the front-wing and missing the pit entrance altogether. While Senna made his way back to the pits very carefully, Marc Surer's engine gave up, ending a brilliant race in tears. Meanwhile, Rosberg passed Senna again when the Brazilian went into the pits for fresh tyres and a new nose-cone, costing him 25 seconds. Senna rejoined the race in third, just behind Niki Lauda. Only a short battle was the result, with young Senna charging hard, sliding through the corners behind the old fox Lauda. On the Brabham Straight Lauda let Senna pass, almost like handing over the crown of the great champion from the man on his way out to the kid on the way to the top. With Senna having had his crashes and pit stop, Rosberg comfortably led by 30 seconds when all of a sudden the Finn came back into the pits for fresh tyres. This could have easily kept him in the lead, if it weren't for the left front tyre being jammed! By the time the problem was solved, both Senna and Lauda had already passed Rosberg. However, right after Senna took the lead from Rosberg, Lauda passed the Brazilian to take the lead himself. Now was the time for Rosberg to charge hard, resulting in the fastest race-lap for the Finn. As Lauda braked into the sharp righthander at the end of the Brabham Straight, his McLaren turned sharply left, ending the Austrian's long career in the wall and giving Ayrton Senna the lead once again. On the very same lap, Derek Warwick's Renault also gave up, ending a terrible season for the Briton. And then, only shortly after Senna had regained the lead, Rosberg got the lead thrown into his lap once again, when Senna's engine expired in big flames. 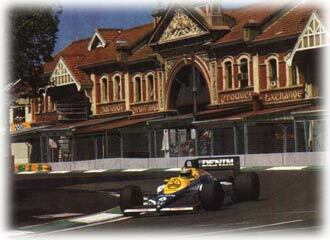 This miraculously put both Ligiers in podium positions behind Keke Rosberg. However, much to the amazement of everyone, the Finn came back in for his fourth set of tyres. After the race he would comment that he went in for new tyres whenever he had time on his hands, because he believed it was better to stay safe on the tyres, while they lasted. Meanwhile far behind, Stefan Johansson in the Ferrari and Gerhard Berger in the Arrows dodged and dived past each other in the battle for fifth, eventually ending with Berger going straight into the tyre-wall. Before them both Ligiers were fighting as if the title was at stake, with Jacques Lafitte swinging his fist out of the cockpit towards his teammate Philip Streiff. On the final lap, Streiff made his final try to move past Lafitte. The Frenchman closed the gap, causing Streiff to damage his left front suspension, driving home with the wheel bumping and bouncing along the side of the car. After 2 hours and 40 seconds, the first Australian World Championship Grand Prix ended with Keke Rosberg the winner, followed by Lafitte, Streiff, Ivan Capelli in the Tyrrell, Stefan Johansson and Gerhard Berger. With a winner having three pit stops, two Ligiers, a Tyrrell and an Arrows in the points and more action than in a complete season these days, this was certainly a race to remember. With having bigger dramas in the years after, this race might have been forgotten a bit, but it shouldn't be. It showed the tremendous talent as well as the recklessness of Ayrton Senna. With as much as six past or future World Champions in this race (Rosberg, Lauda, Prost, Senna, Piquet, Mansell) the starting field was as talented as it would ever get in the modern age, while also showcasing the talents of those who didn't make it all the way, such as Surer and Alboreto. This all turned into a whirling mixture of top level Grand Prix racing to be envied. Indeed, those were the days!